When Cindy was a child she lived in Santa Ana. Her father worked most of the time so he wasn’t around. When she was in school she liked to draw and considered working with animals in the future. Cindy’s happiest moment was when she had her three kids. The most important people in her life are her kids and her husband; she says they are her heart. Cindy’s saddest moment was when she lost her father and was unable to say goodbye to him. Cindy is grateful that she is alive and healthy. She had cancer in 2012 and is a survivor. Cindy is a very strong woman and even though she has experienced a lot of misfortune, she still manages to smile and laugh. Grateful for: the support I receive from the people in my life. When I decided to join this project I did not know much about the homeless community. 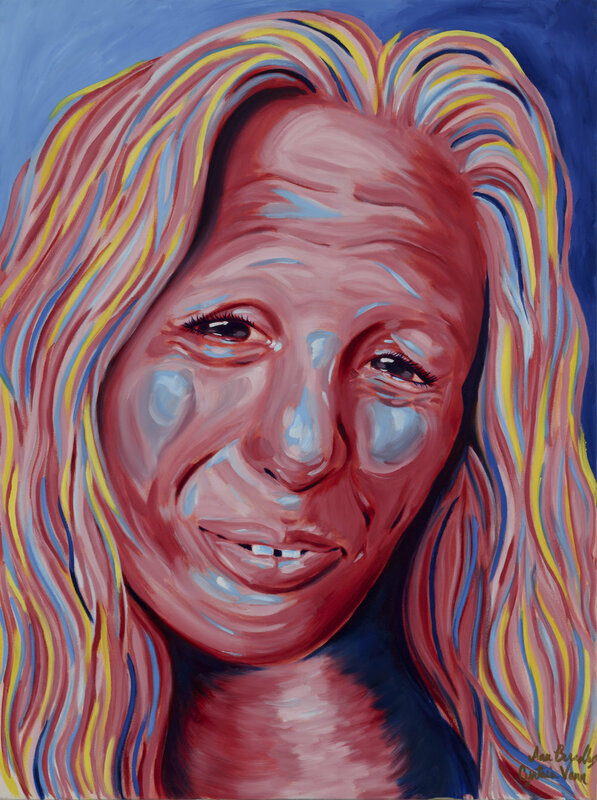 During the time I’ve been painting Cindy’s portrait, I have learned a lot about what it is to be homeless and I learned to be understanding of other people’s struggles. I used blue in the background of Cindy’s portrait to show that she has lived through misfortune in the past, but that is all behind her now. I used pink and yellow to show that she is a strong woman with an amazing personality.